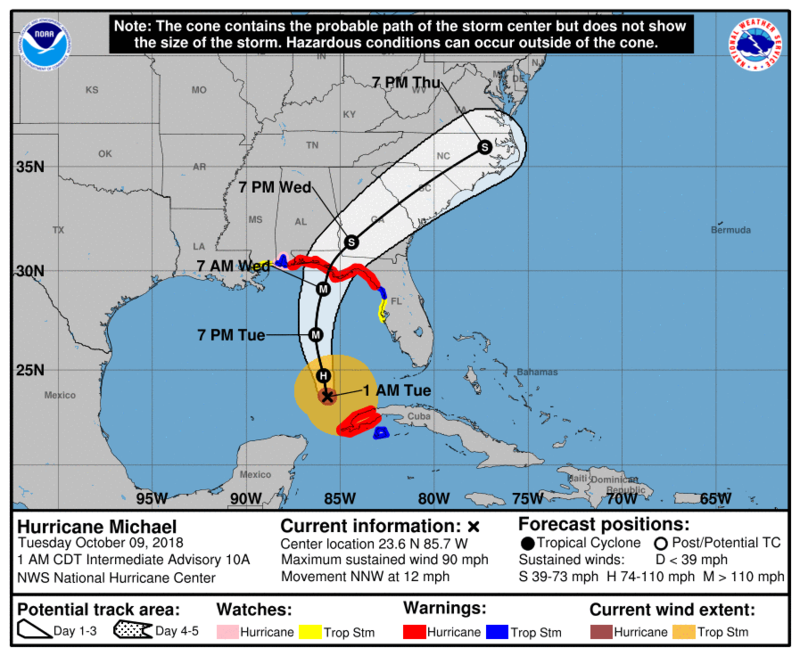 Hurricane Michael strengthens as it moves into the Gulf of Mexico and by Wednesday could become a category three hurricane. As of 1:45 a.m., Tuesday, a tropical storm watch is in effect for Appling, Atkinson, Bacon, Clinch, Coffee, Columbia, Echols, Gilchrist, Hamilton, Jeff Davis, Suwannee, and Ware. 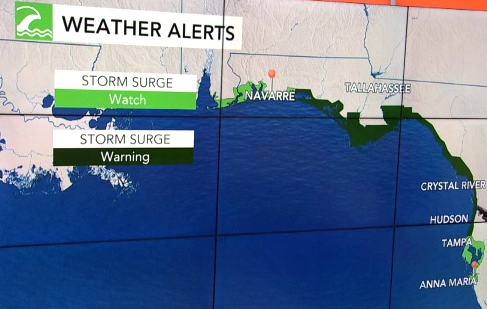 According to the U.S. National Weather Service, the storm is approximately 480 miles south-southwest of Gainesville, or 580 miles south-southwest of Waycross, Georgia. The storm is moving at 12 MPH with an intensity of 90 MPH. A storm surge and tropical storm warning remain in effect for Crystal River and Homosassa. Wind gusts of up to 45 MPH are expected, which is a decrease from 57 MPH from previous forecasts. Residents should secure any lightweight objects. The Homosassa and Crystal River areas have the potential for 5-8 feet storm surges in prone areas. This will be a concern from Tuesday afternoon to Friday evening. Additional rainfall of 1-3 inches is expected and higher in some areas. The conditions are also favorable for tornadoes. Inland Citrus County is also under a tropical storm warning. This includes Inverness, Homosassa Springs, and Crystal River. Wind gusts of up to 35 MPH can be expected. Due to heavy rain, localized flooding may occur. Thunderstorms are excepted. Again, the conditions are favorable for tornadoes. If you do not know what zone you are in, refer to the Evacuation Zone Map at www.sheriffcitrus.org or gis.citrusbocc.com/address-lookup.html. This immediate evacuation order takes effect Tuesday, October 9, 2018, at 9 a.m.
SCHOOLS CLOSED: The Citrus County School Board has closed schools for both Tuesday, October 9, and Wednesday, October 10, in anticipation of Hurricane Michael. Shelters will open Tuesday, October 9, 2018, at 9 a.m. There is a limit of 25 bags per vehicle. For storm information call 352-249-2775, 352-249-2776, or 352-249-2777.